Novità prodotto Zomo, Luglio 2017. Case per player e mixer, bag morbide per controller e tanto altro..
Di seguito tutte le novità prodotto a marchio Zomo. Case universali, set di case per player e mixer, supporti per vinili, bag morbide e rigide per controller e tanto altro..
Zomo proudly presents a new addition to their product family: Zomo LP-50 box, a new elaborate solution for transporting and storing you vinyl collection. The Zomo Set 2900MK2 Plus NSE - NightStyle Edition - was specially designed for the transport and storage of two Pioneer CD players and a Pioneer mixer. The sturdy Zomo 750 NSE flightcase has especially been designed to transport or store two Pioneer XDJ 700 and the Pioneer DJM 350 Mixer. 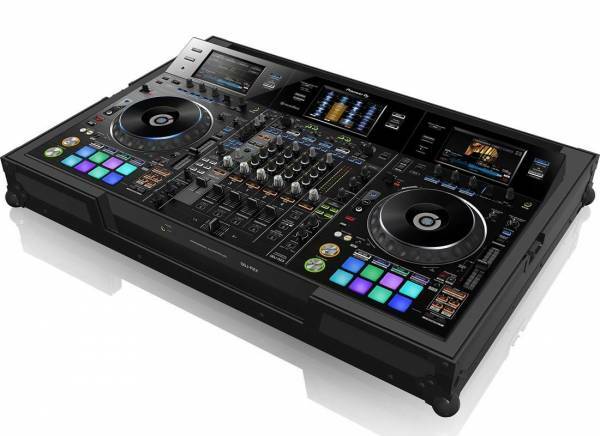 The Zomo 700 NSE flightcase has especially been designed to transport or store two Pioneer XDJ 700 in addition to a standard 12” mixer. The Zomo FlightBag DJM-250 is a perfect combination of DJ-Bag and Flightcase. The FlightBag is specifically matched on different Controllers and provides excellent protection and serves generous features for your equipment. The professional Zomo Flightcase MC-7000 NSE is an robust flightcase for the transportation and storage of Denon DJ MC-7000. The professional Zomo Flightcase MC-7000 Plus NSE is an amazingly robust flightcase for the transportation and storage of Denon DJ MC-7000 and your laptop. The professional Zomo Flightcase DJ-808 NSE (NSE = NIGHT STYLE EDITION) is an amazingly robust flightcase for the transportation and storage of Roland DJ-808 and your laptop. The Zomo Spirit Level water bubble level is the perfect tool for leveling your turntables, speakers or other devices. It also makes levelling your tonearm or headshell as easy as pie. The Roland DJ 808 MIDI DJ Controller specifically matches to the Zomo FlightBag, which provides excellent protection and serves generous features for your equipment. The model Studio of the new Zomo VS Rack-series by Zomo is a new and groundbreaking option for vinyl storage. The model Loft of the new Zomo VS Rack-series by Zomo is a new and groundbreaking option for vinyl storage. The model Cube of the new Zomo VS Rack-series by Zomo is a new and groundbreaking option for vinyl storage. The model Wall of the new Zomo VS Rack-series by Zomo is a new and groundbreaking option for vinyl storage. The professional Flightcase DDJ-RZX NSE is an amazingly robust flightcase for the transportation and storage of Pioneer DJ-Controller DDJ-SZ and your laptop. The Zomo P-SP12 Toraiz NSE Flightcase is suited and was developed for the Pioneer Toraiz SP-16. The Zomo PLX-1900 NSE - Night Style Edition - is designed and developed explicitly for the transport and storage of two Pioneer Turntables, as PLX-1000 or PLX-500 and for the one Pioneer DJM-900NXS2. The robust Zomo PLX-1900 Plus NSE - Night Style Edition - is designed and developed explicitly for the transport and storage of two Pioneer Turntables, as PLX-1000 or PLX-500 and for the one Pioneer DJM-900NXS2 plus one notebook. Zomo CDJ Tour-1 NSE is an extraordinarily sturdy, professional flightcase for top-tier DJs and rental companies. This case has been developed to perfectly fit the CDJ Tour-1 CD Player from Pioneer. Zomo DJM Tour-1 NSE is an extraordinarily sturdy, professional flightcase for top-tier DJs and rental companies. This case has been developed to perfectly fit the DJM Tour-1 CD Player from Pioneer.